Anthony Nappa wears several hats at once: as winemaker for Raphael, a major winery on the North Fork, as founder and owner of Winemaker Studio in Peconic, Long Island, and as winemaker for his own brand of wines with intriguing names like Anomaly, Luminous, Spezia, and more. Of the eleven Nappa wines that are presently offered at the Winemaker Studio three have earned 90 points from Wine Enthusiast and a red has won 91 points–the highest score ever by WE for a North Fork wine. That’s really quite remarkable for such a small producer—albeit clearly a gifted one. 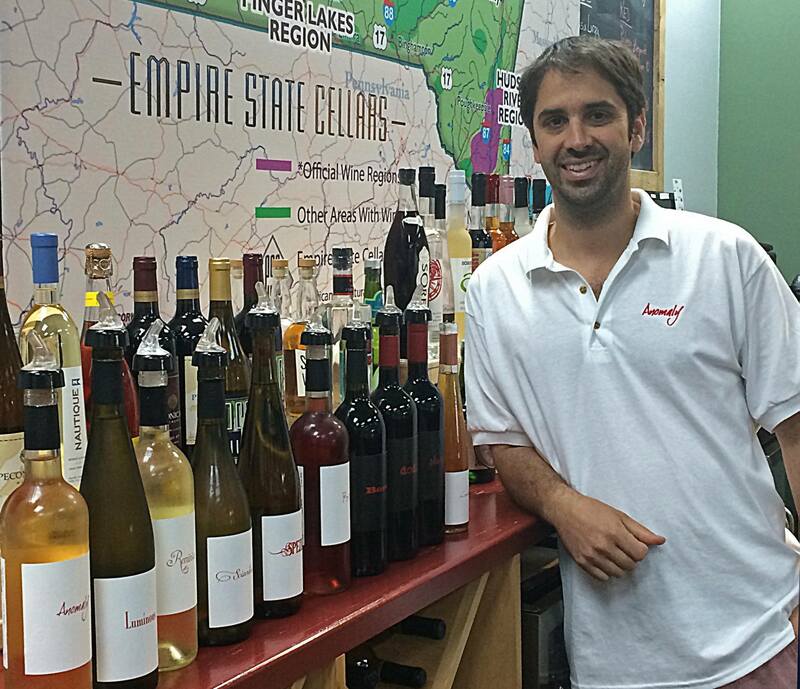 Anthony’s road to becoming a winemaker in Long Island was, as is so often the case, circuitous. Born in Massachusetts, he went to the University of Massachusetts in Amherst to earn a degree in agriculture with a focus on fruit-growing. A couple of years later he decided to obtain a degree in viticulture and found that the program at Lincoln University in Christchurch, New Zealand, was the most economical for an English-speaking country. It ended up being a degree in oenology as well, and that was where it discovered that he had an aptitude for it. Four years later he went to Italy, where his family is from, and spent a year at a winery near Naples. After six years abroad he returned and helped start a winery, Running Brook, in southern Massachusetts. He was there for a year before moving on to California to try winemaking there, but West Coast life wasn’t for him. Finally, in 2007, he came to Long Island, got married, and in partnership with his wife, Sarah Evans, who works as a chef, started making his own wine while working at Shinn Estate. I met him several years ago, when he was at Shinn (2007 to 2011). He went there with the understanding that he could use their facilities to make wine for his own label, which bears his name. His first wine under his label was 200 cases of LI Pinot Noir that he dubbed Nemesis. After he left Shinn he focused more on his own wines and made them at Premium Wine Group, the custom crush facility in Mattituck. For example, Anthony has made Nemesis, his first wine, a Pinot Noir, only once. He eschewed making again until this year as he did not find grapes of the quality he demanded for making that varietal again. Talk about fussy. Anthony operates on the idea of honesty in all things bearing on his wine: honest wine that is made with minimal manipulation (if any) and reveals its varietal character; honest marketing—with full disclosure of how the wine is made; and honest labeling—straightforward and direct, without unneeded embellishments. A testament to that is found in his wine spec sheets which accompany each of his wines. Talk about full disclosure. Anthony’s The Winemaker Studio is owned and operated by him and his wife, Chef Sarah Evans Nappa, of Anthony Nappa Wines. They moved to the North Fork in 2007 and in the same year Anthony established his own wine brand, Anthony Nappa Wines while working as winemaker for Shinn Estate. His first wine was Nemesis, a white wine made from Pinot Noir, of which 200 cases were made. Sarah has considerable international experience and is previously the Sous Chef at the North Fork Table & Inn in Southold, NY. When she is not looking after their son Leonard (born in 2013), or running the tasting room, she is available for hire as a private chef for small events and dinner parties. 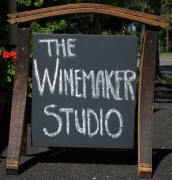 In the beginning Anthony invited other winemakers who were producing their own brands but had no tasting facilities of their own to offer their wines at the Studio. It was a cooperative venture, and tasting rotated with a different brand being highlighted for tasting each weekend. Over time a number of them moved to other tasting rooms that were more connected to their production. For example, Russell Hearn, John Leo, and Erich Bilka all work at PWG (Premium Wine Group, a custom crush outfit) which has its own tasting facility, The Tasting Group, for brands that are made at PWG. So while their wines are now available at retail from the Studio, their wines are no longer offered as part of the tasting menu, which now only highlights Anthony’s own wines and Greg Gove’s Race label of wines. Race wines by Greg Gove, former winemaker at Peconic Bay Winery—now closed. Coffee Pot Cellars from winemaker Adam Suprenant of Osprey’s Dominion Vineyards, who now has his own tasting room. Anomaly, so named because it is just that: a white wine made from a red grape–in this case Pinot Noir. According to the spec sheet for this wine, the fruit is sourced from several vineyards: that from the Finger Lakes brings acidity and fruitiness, while from the North Fork the grapes impart more structure and body. Together the blend brings forth a good balance to Anomaly. All the fruit comes from sustainably-maintained vineyards. The grapes are hand-harvested and gently pressed with no skin contact, but using red-wine yeast from Burgundy. Cold-fermented for two weeks, no oak was used nor was there a malolactic fermentation. It was bentonite-filtered for heat stability, cold-stabilized, and sterile-filtered before bottling. The 2013 Anomaly comes from an excellent vintage characterized by a cool summer and 50 days without any precipitation until harvest, resulting in fully-ripe and very clean fruit. The wine is of a medium lemon color with a slight blush, with a full body, firm acidity, and notes of strawberry, white peach, and a minerally finish, perfect as an aperitif or summer wine. 12.3 % abv; $20; ; 90 points from Wine Enthusiast. Drink within a year. The 2012 Dodici is a blend of 67% Merlot, 28% Cabernet Franc, and 5% Cab Sauvignon; the fruit, of an excellent vintage, came from two pre-eminent vineyards on the North Fork: McCullough and Matebella, which are sustainably farmed. The spec sheet also tells us that the grapes were fermented after 5 weeks of maceration and aged separately for 18 months in French oak, only blended just prior to bottling unfiltered and unfined. Just 187 cases were produced. The resulting wine is a deep brick-red color with suggestions of tobacco, licorice, and red fruit on the nose while offering a full body and a nice, long finish with mineral notes. Drinkable now, it could be laid down to evolve for five more years. It will happily accompany any red-meat dish or go with a full-bodied cheese. 13.2% abv; $35; 91 points from Wine Enthusiast. Anthony’s 2013 Chardonnay has an Italian spelling that reflects what he considers to be a “rustic Italian style,” but given that the grapes come from McCullough Vineyards one might wonder if there weren’t a touch of the Irish about it as well. Anyhow, the vintage has been described above and as a result the fruit shows beautifully. Unoaked, the wine was fermented with wild yeast and then underwent a malolactic fermentation, yielding aromas of ripe peaches, citrus, and buttery notes. With that we have a full-bodied wine with firm acidity and a medium-length with some minerality. In fact, we’d call it elegant, and it has excellent typicity–this can be nothing other than a Chardonnay, and a very-well made one at that. Perfect with any fish or seafood. 13.9% abv; $20; ; 90 points from Wine Enthusiast; to drink now or hold for a few years. This entry was posted in Vinification, Wine bars and tagged Anomaly wine, Anthony Nappa, Chef Sarah Evans, Dodici wine, Greg Gove, Long Island wine, Nemesis wine, North Fork AVA, North Fork tasting room, North Fork wine, Race Wines, Raphael Winery, Sciardone wine, Spezia wine, white Pinot Noir, Winemaker Studio on 30 November 2014 by JoseM-L.